VENETIAN PLUS SUNLESS SOLUTION: In less time than you can fly to the European Riviera, and minus the jet lag, you can get the same deep, rich colour that you crave. An exotic sunless formula with a unique combination of violet and brown tone bronzers, designed to mimic skin colours found on the beautiful beaches of the European Riviera. This first of its kind, deliberate and innovative formulation blends with all skin tones to produce a deep, long lasting tan. FEATURES AND BENEFITS: The quality of DHA used in sunless products is directly related to the outcome of your sunless tan. Natural Enzymes to repair weak, dehydrated skin and promote the efficiency of the body's own natural moisturization factor. Unique dermal barrier locks DHA within the top layer of skin. Formulated without Parabens, Gluten, Sulphates, Phthalates, Synthetic Fragrance, Petrochemicals, GMO's, Triclosan. This product is designed for use in all airbrush/HVLP systems. SAY GOODBYE TO THE ODOR: These superior spray tan solutions are infused with natural essences. The Venetian scent is Paradise Breeze, a deliberate fragrance combination that helps to eliminate the unpleasant sunless tanning smell. Not just pleasant to smell, these formulations also trap and encapsulate the malodour molecules that occur when DHA reacts with the chemistry of one's skin, rather than merely masking it. 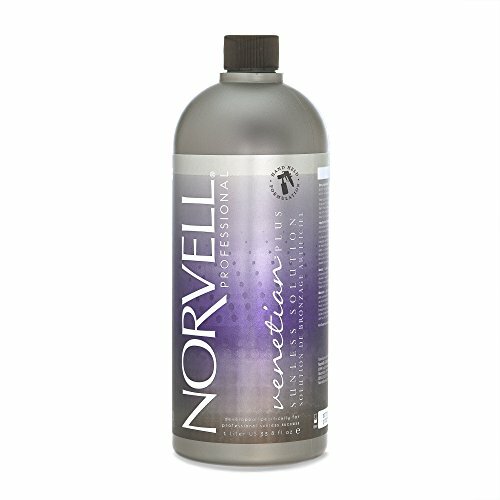 NORVELL PRODUCTS HAVE A SHORT SHELF-LIFE: Due to the high quality of ingredients that are used to manufacture Norvell products, the typical shelf-life is 7 months from the production date to the expiration date. Please note that the transit from the manufacturer to Amazon and to the final consumer should be accounted for when purchasing Norvell products. NORVELL TANNING SOLUTIONS HAVE A "BORN ON" DATE, NOT AN EXPIRATION DATE! View More In Self-Tanners & Bronzers.